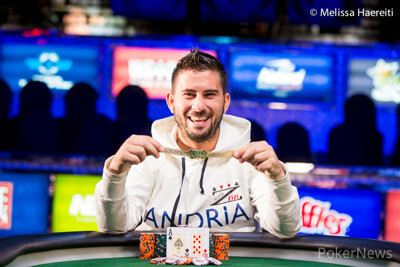 Davide Suriano Wins the $10,000 Heads-Up Championship ($335,553)! We began Event #40, the $10,000 Heads-Up No-Limit Hold'em Championship, with 136 players. After 135 matches, only one emerged with an undefeated record. 25-year-old Davide Suriano outlasted the field, capturing his first World Series of Poker gold bracelet and a $335,553 pay day. While Suriano was not among the elite names at the start of the event, he beat his fair share of the game's best to capture the title. Suriano received a bye in the play-in round, automatically sending him to the round of 128 where he faced Scott Seiver. A short-stacked Seiver got his chips in with against Suriano's . A king on the river fell to give Suriano the victory, setting up a match against Dan Cates in the Round of 64. The chips went in very early and Suriano trailed with against Cates' , but the board ran out , giving Suriano a set to earn a seat against Shane Moran in the Round of 32. After gaining the upper hand, Suriano locked up the min-cash when his held up against Moran's . With Day 1 in his rearview mirror, Suriano began Day 2 by facing Serkan Kurnaz. In what turned out to be the longest match in the Round of 16, Suriano closed it out when Kurnaz shoved the river of a board with . Suriano called with for a full house to advance to the Round of 8 for a date with online heads-up specialist Ankush Mandavia. Suriano made relatively quick work of Mandvaia, sealing the deal when his held against Mandavia's . The next round brought another heads-up phenom in Daniel Colman, but once again Suriano controlled the pace of the match. He locked up the victory when his topped Colman's . Suriano flopped a set, turned a full house and was on his way to the final for a match with Sam Stein. In what many expected to be a slow, long and drawn out heads-up duel, Suriano put the pedal to the medal immediately. He never once surrendered the chip lead and closed it out in just 36 hands. "This victory is going to change my life," Suriano told our own Remko Rinkema after the match. Congratulations to Davide Suriano on his excellent achievement and thank you for following our hand-for-hand coverage of his victory! Hand #36: Davide Suriano raised to 125,000 and Sam Stein moved all in for 1,175,000 from the big blind. Suriano gave it some thought before eventually making the call to put his opponent at risk. "If I win this one it's going to be all over," Stein said with a smile before the flop came down . The board ran out , and Stein was knocked out. Suriano's friends jumped all over him to celebrate the seventh bracelet for Italy in World Series of Poker history. 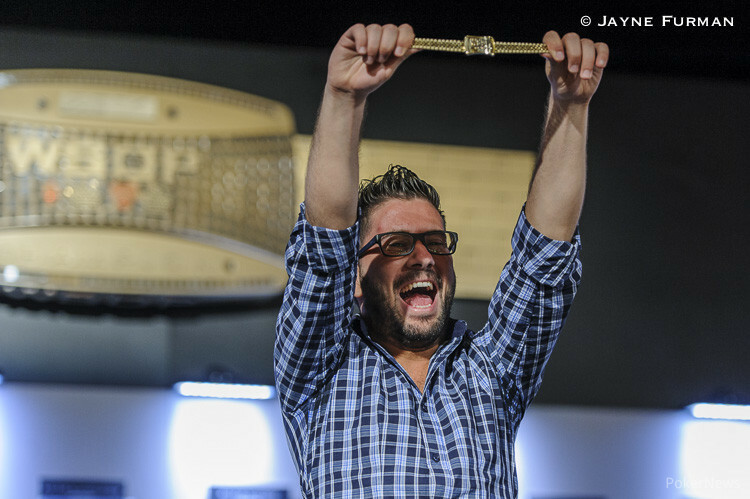 Hand #34: Davide Suriano raised to 125,000 from the button and picked up the blinds. Hand #35: Davide Suriano received a walk. Hand #28: David Suriano raised to 150,000 on the button and Sam Stein called from the big blind. They checked to the turn of a board of where Suriano bet 100,000. Stein called to the see the river, which both checked. Suriano tabled for aces full or fours to win the pot. Hand #29: Sam Stein raised to 100,000 on the button and Davide Suriano three-bet to 375,000 from the big blind. Stein folded. 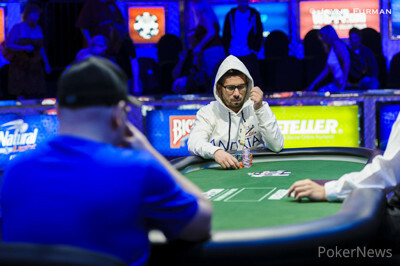 Hand #30: Davide Suriano raised to 150,000 on the button and Sam Stein defended his big blind. 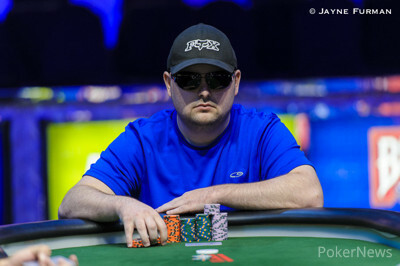 The flop came down and Stein check-folded to a bet of 200,000 from Suriano. Hand #31: Sam Stein raised to 100,000 on the button and Davide Suriano reraised all in to effectively 1.26 million. Stein tanked for about 45 seconds before he folded. Hand #32: Sam Stein got a walk in the big blind. Hand #33: Sam Stein raised to 100,000 from the button and Davide Suriano folded. Hand #24: Davide Suriano raised to 125,000 and Sam Stein called from the big blind. The flop brought out and Stein checked to Suriano who bet 150,000. Stein called and on the turn the popped up. Stein checked and Suriano grabbed more chips, as he bet 600,000. Stein folded and Suriano picked up this pot. Hand #25: Sam Stein raised to 125,000 from the button and Davide Suriano called. The flop brought and Suriano checked to Stein who bet 125,000. Suriano called and on the turn the popped up. Suriano checked again and this time Stein checked behind. The fell on the river and both players checked. Suriano showed and raked in another pot. Hand #26: Davide Suriano called from the button and Sam Stein checked. The flop brought on which both players checked. The turn was the and both players checked again. Stein bet 50,000 on the river and Suriano called showing , which was enough to take down this pot. Hand #27: Sam Stein raised to 125,000 from the button and Davide Suriano called. The flop brought and Suriano checked to Stein who bet 150,000. Suriano called and on the turn the hit. Suriano checked again and Stein bet 425,000 this time around. Suriano called and the river completed the board with the . Suriano checked and Stein checked behind. Suriano showed and Stein mucked his cards once again. Sam Stein vs. Davide Suriano For the Bracelet!